Good morning friends! I hope your week is getting off to a good start. 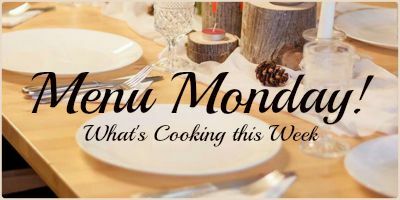 I'm going to work harder at remembering to take a pic of completed meals during the week and hopefully have them to show you and share how they turned out. This may be a work in progress for me, so be patient ;) This week I have two to share. 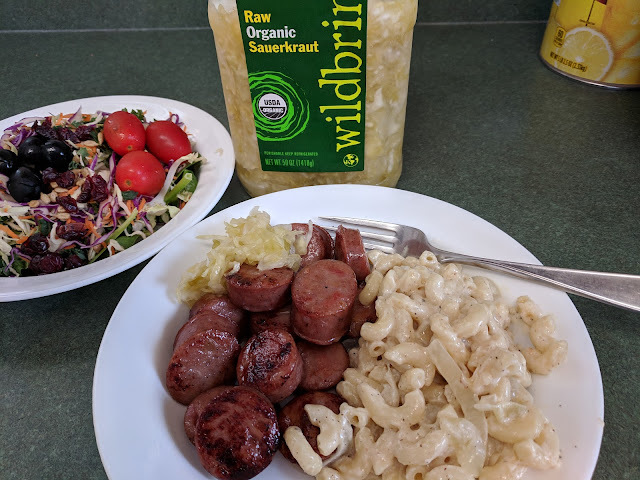 On Friday's grocery haul I shared the sauerkraut I purchased at Costco. This was fresh, raw, organic, full of probiotics, and all that good stuff type. We tried it with our sausages for dinner and let me tell you... It was delicious!! If you like sauerkraut I can highly recommend this stuff. Talk about a yummy meal. I pan fried the sausages and had the macaroni left from another night. I dressed it up a bit (which I'll share more about on Wednesday) and served it with salad made up from my Salad Mix. 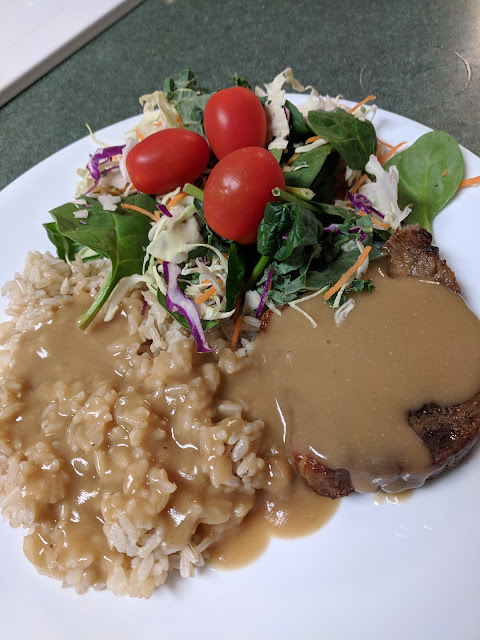 Yesterday I made the pork steaks (I prefer the steaks over the chops but the same process could be used with chops as well), gravy and rice from last weeks menu. I made a double batch and we are having that tonight for dinner. This meal turned out delicious. I seasoned the pork chops with salt, pepper, garlic, and Worcestershire sauce. I baked them at about 375 for 45 minutes. I always use a thermometer to check the temps of my meat to ensure they are done. Pork should cook to 165 degrees. While the pork was in the oven I got my brown rice cooking in my Instant Pot. 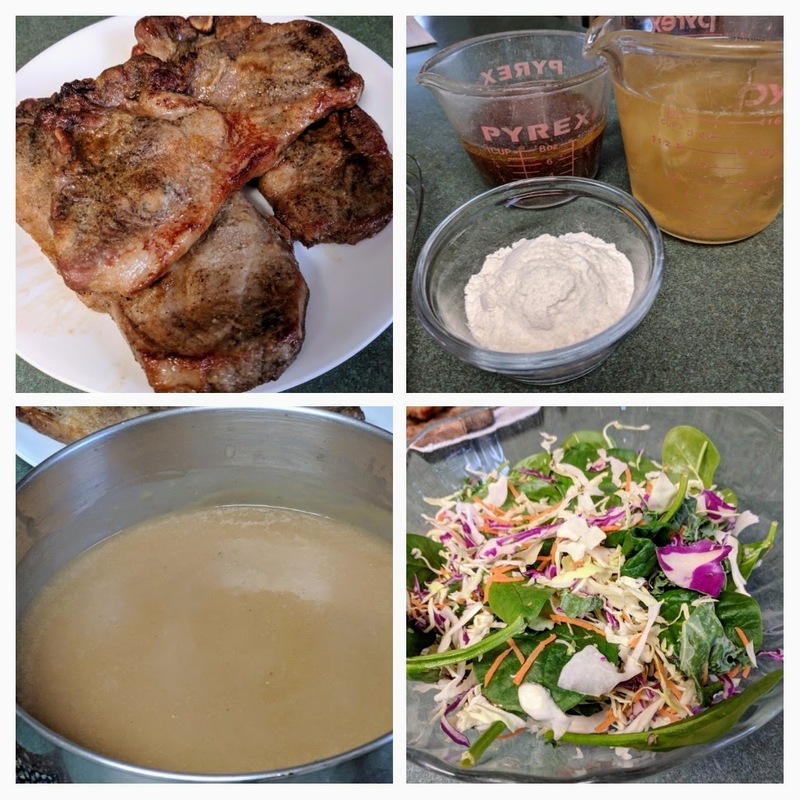 I moved the steaks to a plate when they were done and poured the juices out to use in my gravy. I had about a cup of juices and then added 2 cups of homemade chicken broth (broth I made from the bones of the rotisserie chicken we had last week). I used these juices and broth to make gravy. It was just your basic gravy. I melted 4T of butter, added 6T of flour and let that cook for a bit then added all my liquids and whisked it up and let it come to a boil. I boiled for about 4 or 5 minutes until everything was nicely thickened. The flavors were so good. Now onto this weeks plan..
Monday: Leftover pork steak, rice, gravy and salad. Tuesday: Pizza – take two – Ha! I had this on my menu last week and it was the only meal we did not have and I'm still craving pizza. Wednesday: BBQ? - my hubby suggested a winter bbq (we seem to bbq in all seasons and all weather! :). If we do this, then it will steak, french bread, salad. If not, I'll think of plan b! Thursday: I have a few individual freezer meals that I want to make sure get rotated and used. I'll do that and add a salad and whatever other sides seem appropriate to the meal.